KNAPP AG, headquartered in Hart bei Graz, Austria, was awarded the contract to build a turnkey automation solution with shuttle technology, manual storage and picking areas as well as a warehouse management system for the new “Europa Distributions Center” for Victorinox AG, a Swiss company of long-standing tradition. The new “Europa Distributions Center” will be built near the company headquarters in Ibach/Schwyz. 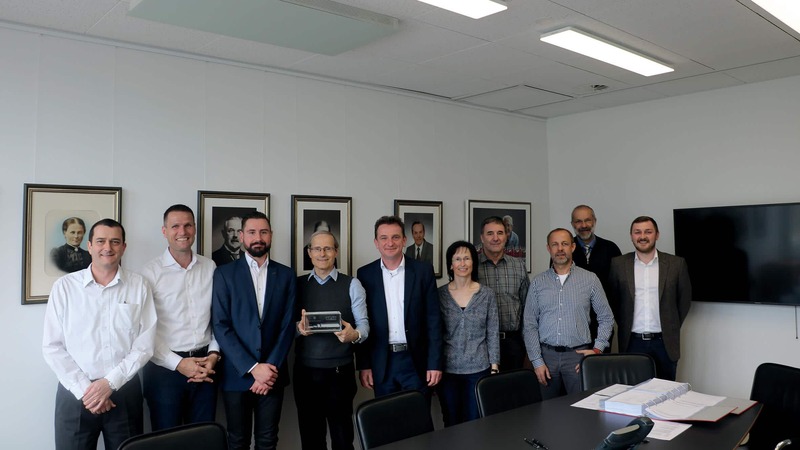 Carl Elsener, CEO and Chairman of the Board of Directors at Victorinox AG, and Heimo Robosch, Executive Vice President of KNAPP AG, celebrated the official signing of the contract. Victorinox develops and sells worldwide one-of-a-kind high-quality products of great practical value: Swiss Army knives, household and professional knives, watches, travel gear and fragrances. Today a modern, international company, Victorinox looks back on a long tradition. Over 130 years of quality, tradition and innovation govern the company’s sustainable orientation. Victorinox produces at several locations in Switzerland. The company wanted to centralize storage and simplify both the replenishment and picking processes, and therefore planned the construction of the “Europa Distributions Center”. From April 2020 onward, not only will all shipping be handled through this warehouse, but synergies will also emerge for all product groups and finished products. From a multitude of competitors, KNAPP’s simple and straightforward system design set them apart and won over Victorinox. An OSR Shuttle system with 37,500 storage locations is a central part of the solution and provides various types of storage for their products. Maximal storage density and inventory coverage is the happy result. Products are stored in the system in containers, full cases or on trays. Replenishment is handled by guided VNA forklifts that pick pallets and oversized products from the 9,000 storage locations in the high-bay racking. All products coming from the OSR Shuttle are picked using the goods-to-person method. The ergonomically designed work stations of the Pick-it-Easy series allow intuitive and error-free operation. Before the orders are collected for packing, they pass through the value-added service area, where watches are given high-quality packaging, or knife sets are individually assembled. An integrated rail connection to the busiest route in Europe makes the project unique worldwide. A separate track of the Swiss Federal Railways takes large delivery quantities of production material directly into the new hall. Carl Elsener, CEO and Chairman of the Board of Directors at Victorinox AG (right) and Heimo Robosch, Executive Vice President of KNAPP AG (left) signed the contract at the Victorinox headquarters in Ibach, Switzerland.